Plank Road (58th Road in Maspeth, Queens) is a revitalized street end with known historic and ecological significance on Newtown Creek. With support from the NY-NJ Harbor & Estuary Program, the New England Interstate Water Pollution Control Commission (NEIWPCC) and New York State Department of Conservation, the Newtown Creek Alliance helped to transform Plank Road from an overgrown, muddy and littered street-end to a clean and rejuvenated public shoreline. Situated in a dense industrial area, Plank Road now offers an inviting landscape for local employees and the general public seeking respite. During our restoration project the Alliance worked with a number of city agencies including: Transportation, Sanitation and Environmental Protection. The Alliance received a generous donation of materials, labor and equipment from neighboring US Concrete to help landscape the site. 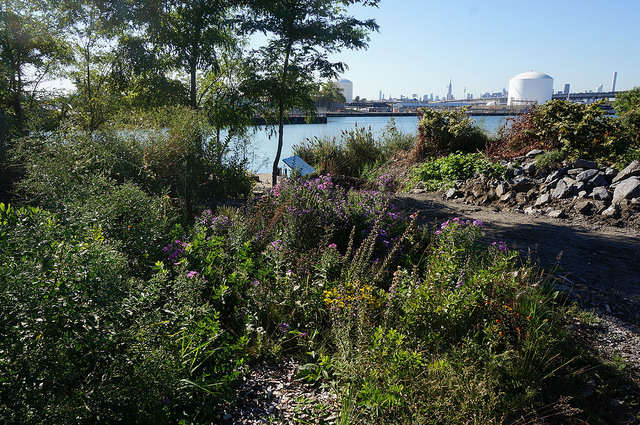 The site features a path from street to the water, a native pollinator garden, mulched pathways and signage signifying the historic significance of the area. We invite you to check out the Plank Road site for yourself; find it on google maps here. NCA looks forward to continuing our restoration work at Plank Road as well as replicating the success of at other street end sites along the Creek. The Plank Road site represents the remnants of Maspeth Toll Bridge Co.’s Plank Road, which crossed the Newtown Creek in the 1800’s. Part of the wooden structure is still visible in the intertidal zone, and bridge anchorages are still clearly visible on both the Queens and Brooklyn side, at Maspeth Avenue. The bridge connected the early communities of Maspeth and Newtown, crossing through what Mitch Waxman describes as “the hellish expanse of Fuhrman’s Island (home to Peter Cooper’s Glue Factory and Conrad Wissel’s Night Soil and Offal Dock, amongst other notorious or malodorous occupants)” to bring products to market in Williamsburg and, via early ferry service, to Manhattan.